Technology for Educators | Finding technology for the rest of us. WordPress.com has served me well, but operating on their servers comes with some limitations that don’t work well for the kind of blog that I have. You can now find me at suefrantz.com. I’ve imported all of my old blog posts to the new server, so if you want to revisit a post, you can do that over there. If you have this blog coming into your RSS feed reader, click here to get the new feed. I’ll see you over there! 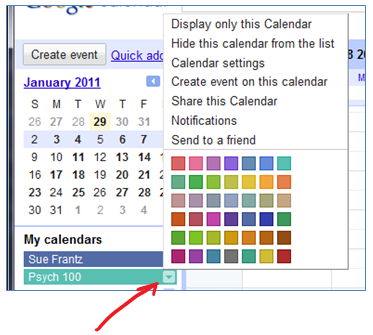 There are a few advantages to using Google Calendar, such as. It syncs easily with my Android phone. I can share a calendar with my partner. All of our social engagements and travel go there. Here’s another advantage. 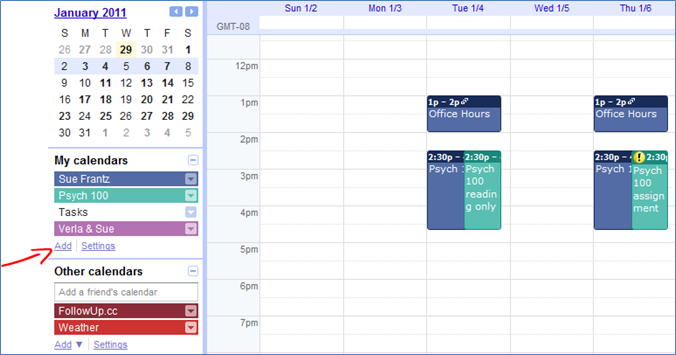 I can create a calendar for my class schedule that way I don’t have to dig out my syllabus to see what’s coming up. I can just look at my calendar. By creating it as a separate calendar, I can turn it off when I’m not using it so it doesn’t clutter up my day-to-day calendar. I can also create is as a publicly-accessible calendar so my students can also access it in their own calendars without having to dig out their syllabus. And that’s what I did for my class. After creating the calendar, I put all of my course dates into a CSV file which I created in Excel, and uploaded to the calendar. On the left you can see my calendars. “Sue Frantz” is my personal calendar that I sync with Outlook. To the right you can see my “Sue Frantz” calendar items are displayed in blue. The “Tasks” calendar is shut off. “Verla & Sue” is the calendar I share with my partner. “FollowUp.cc” displays my FollowUp.cc reminders. “Weather” gives me the weather forecast for the next few days. Click the “Add” link to generate this page. 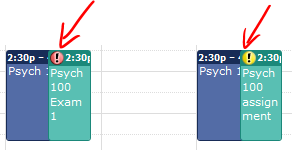 Put in your calendar name (I called mine Psych 100). Include a description and location if you’d like. 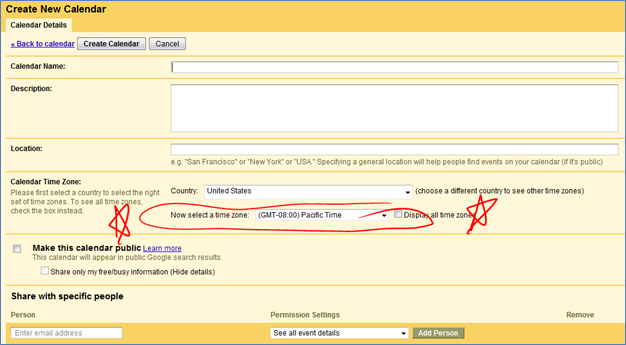 Crucially important: Select your time zone. When we import all of your calendar data from the CSV file, if you haven’t selected a time zone, all of your times will be off by 5 hours or so. When you click “Create Calendar” at the top of the page, the page will disappear, and you’ll be returned to your main calendar page. If your new calendar isn’t there, count to five, and reload the page. Now, just because you have a calendar doesn’t mean that anyone knows about it. Even the people you’ve given permission. Let’s do some tweaking and then get the URL to give to our students. Click the down arrow next to your calendar. Select the color you’d like. Appearance is important. Now select “Calendar settings.” On that page, scroll to the bottom to see this. 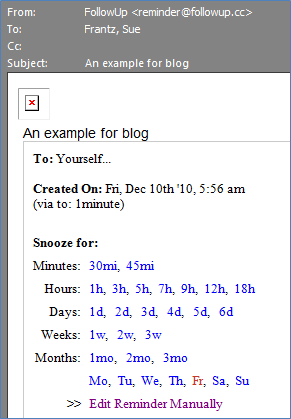 If you want to embed your calendar on a webpage, copy the html code, edit your webpage in html view, and paste the code where you want it the calendar to appear. A word of warning: Some browsers don’t allow iframes, so any visitor with such a restriction won’t see your calendar. Alternatively, provide a link to your calendar. In the “Calendar Address” section, click “HTML” to get the URL. This is what the public calendar looks like. Clicking any of the events calls up more information about the event. At the very bottom right of the calendar is this icon. For your students who have Google Calendar, clicking will add your class calendar to their calendars. 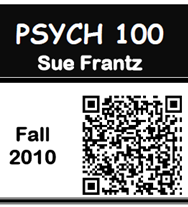 To see my Psych 100 calendar go to my Psych 100 webpage. The link to the calendar is under the syllabus information. While you could click on each date and time to enter your calendar events, it would be tedious. Instead, we’re going to create a CSV file to upload to the calendar. It’s still a little work, but less tedious. Open Excel (or any other spreadsheet program). Save the file as CSV file so the file has a .csv extension. For example, I opened Excel, went to “Save As,” typed in Psych100 and selected CSV from the dropdown menu. 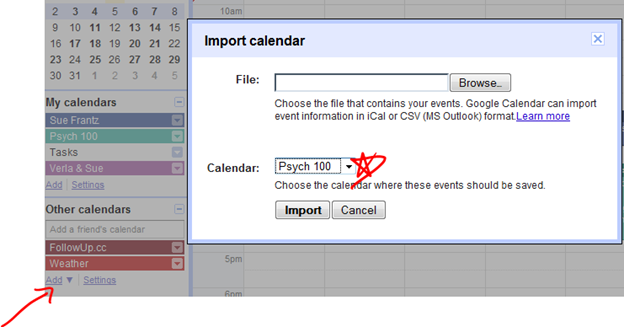 Before you do anything else, change the calendar to the one you want to import to, in this case I was importing to the Psych 100 calendar. You do not want to accidentally upload to the wrong calendar. If you do, there is no way to reverse the import. You will have to delete each entry manually. If you upload the file and the events don’t display as you’d like, you have to remove them from Google calendar manually, one at a time. You may want to only put a couple events in your CSV file to start. If they show up okay, go ahead and enter the rest. I chose to keep my Subject entries short. Those are what will appear on the calendar when you’re looking at the week or day view. If they’re long, they’ll be truncated. If you delete events and then try to upload them again without making any changes to the entry, you’ll get an error saying that Google Calendar wasn’t able to upload a certain number of events. The easiest solution is to make a small change to each event in the Subject column. On the subsequent upload, Google Reader will interpret it as a brand new event and upload it. If your course pretty much stays the same from term to term, for the next term all you need to do is change the dates. You can add icons to your events. Here are how the icons appear with my calendar. 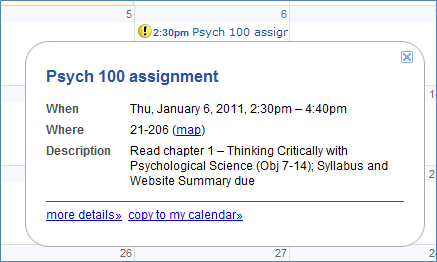 Yellow icons for dates when assignments are due; red icons for exams. And here’s how they appear when you follow the public link to the calendar. To get the icons, from your Google Calendar page, look in the top right corner. Click on the green beaker to go to Google Labs. Enable the one called “event flair.” Go back to your calendar. When you click on an event, the icon palette appears on the right. Select the appropriate icon. Remember, in public calendars, everyone who accesses the calendar can see the icon. If you’ve read this entire post and don’t use Google Calendar yet. Consider it. It provides some nice flexibility. It certainly makes it easy to change the schedule at the term progresses. Of course you still need to let students know what the changes are, but you’ll know that everyone has the same information on their calendars. A number of my colleagues have recently acquired smartphones that run on Android. I promised them that I’d share my favorite apps. Some of them are even relevant to education. Ask-WA (free). For the denizens of Washington State, this is our ask-a-librarian service. No matter the time of day or night, you can pose a question to an on-duty librarian. This service has been around for a while, but now we have it in an easy-to-use Android app. Barcode scanner (free). While you can use it to scan any barcode, such as an item you see at Target to discover if you can find it at a cheaper price elsewhere, I use this mostly for QR codes. Business calendar (free for now). I recently switched to this calendar from the stock Android calendar. It has some functionality that I really like, such as a widget that just shows me what I have for today, the ability to easily turn on/turn off my various Google calendars, and a month view that allows me to swipe across a few days to just see those few days. This app is in beta testing at least through January 12, 2011. Documents to Go (free, but $14.99 for “premium features”). Use this for editing your MS Office documents, including PowerPoint and Excel. You can also edit your Google Docs with this app. Very handy to use in conjunction with Dropbox. Dropbox (free). Access your Dropbox files. Epistle (free). Speaking of Dropbox, this quick-edit app adds a folder to your Dropbox. Open Epistle on your Android phone, and you can quickly edit a document. Alternatively, on your computer, edit a document in Epistle and see it on your phone. I’ve been using it for making my list of errands. It’s easy to add to when I’m at home thinking of what I need to do, and easy to add to when I’m out and about. ICE: In Case of Emergency (free). Not education-related at all. This adds a widget to your opening screen that emergency personnel can use to access your important medical information and emergency contacts. Movies (free). Also not education-related, but essential. See what’s playing and when at your local movie theaters. See reviews of those movies courtesy of Rotten Tomatoes. Add to your Netflix queue if you’d like. OurGroceries (free). Okay. Not education-related either, but if you live with anybody else, this is an essential app. On the OurGroceries website create an account. Share your account with your partner. Your grocery list will be synced to the website and to both of your devices (Android, iPhone, Blackberry). Create multiple lists. For example, I have a list for, among others, Safeway, Walgreens, and Costco. Whenever I add something to a list, either via the website or via my phone, the list is updated on my partner’s phone. OurGroceries remembers the items. That means that I don’t have to type ‘spaghetti’ every time. When I type ‘spa’ I get all the items that contain the ‘spa’ string. At the store, as you pick up items, cross them off by tapping on them. Within seconds, the crossed off items appear crossed off on all other synced devices. PdaNet ($15.95 for a limited time). This app tethers your computer to your Android phone allowing you to use your phone as a modem. I use this mostly when I travel. If I’m staying in a hotel that charges $12.95 a day for internet access, I just attach my computer to my phone instead. Some people have been able to connect via VPN to their office network through PdaNet. I haven’t been able to get that to work, though. Power Control Plus ($1.99). Add a widget to your screen that lets you quickly do things like turn off sound (very handy for class), turn off wifi and GPS (handy for conserving battery power), use your phone’s flash as a flashlight, and a whole host of other customizable options. Reader (free). Access your Google Reader feeds. Swiftkey (1-month free trial; $3.99). This is an alternative to the stock Android keyboard. Its text prediction feature is really good. After some time it learns from what you type and does a pretty good job at guessing what you’re going to say next. Tick! (free). A very easy to use timer. If all you want is to countdown for some number of minutes, this is the timer to use. I use it in class when I want to give my students a certain amount of time to do some task. Where’s My Droid? (free). Have a tendency to misplace your phone? Send a text (say, from Gmail) to your phone to turn on the ringer and call it or send a text to get your phone to send you a text with its coordinates, if you left your GPS on. Again, Gmail works well for this. Click on the coordinates to call up a Google map with a marker pointing to the location of your phone – or within 30 or so feet of your phone. If you can’t find an app to do what you want, create your own with App Inventor. Last month I wrote about BridgeURL, a service that lets you bundle links together into one URL. Controls appear on either side of your browser window that allow you to cycle through the links. Here’s an example of a BridgeURL link. For those of you who are fans of bit.ly, the URL shortener service, they’ve recently added the ability to bundle URLs together. 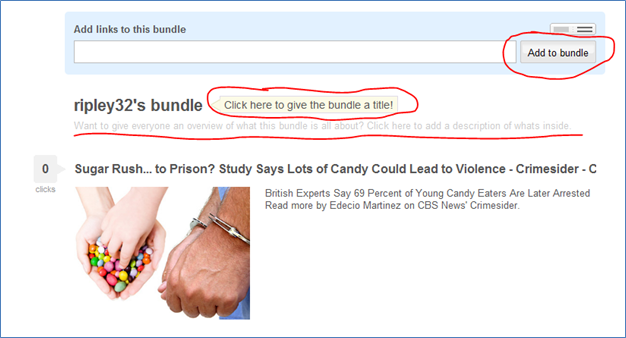 Clicking ‘Bundle’ generates this page where you can add links to your newly created bundle. In this screenshot, you only see the first link. The other two are below it. You can revisit this bundle at any time to add links. I’m going to change the title and give a description of the bundle. When I click the ‘Share’ button, I get the screen below. If I click ‘Copy,’ the URL for my bundle is copied to my clipboard, and I can paste it anywhere I’d like. If I click customize, I can name the link anything that isn’t already taken. For instance, I customized this bundle to this: http://bit.ly/Correlations. If you’re giving links to students in paper form, customizing is the way to go. It’s easier for students to type in that URL than to type in random letters. Once your bundle’s created, you can add links, remove links, and rearrange links. Go back into your bit.ly account, and click on the bundle. Or just follow the link that you created. To add links, copy and paste your link into the box and click ‘Add to bundle.’ To edit your title or description, click on the title to change the title; click on the description to change the description. 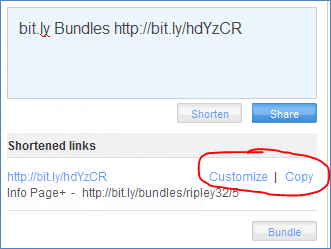 To delete or rearrange links, click the box directly above the ‘Add to bundle’ button. That will collapse all of your links so you’ll only see the titles. Click the garbage can to delete a link. 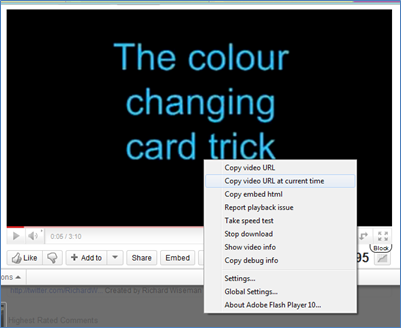 To rearrange the links, mouse over a link, grab it with the hand that appears, and drag it to where you want it to go. That’s it. It’s automatically saved, and your previous customized URL will still work. If you send your students out to the web to visit a number of sites, bundling makes it easier on you and your students. By editing your bundle, you can easily change an assignment without changing the URL you give to your students. 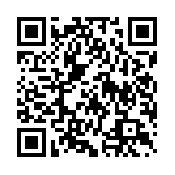 And for those of you have become QR code aficionados, point your smartphone here to go to this bit.ly bundle. RSS feeds are a great way to keep track of what’s new. I use Google Reader, but there are many other ways to read RSS feeds. You can even bring feeds into Outlook. If you’re unfamiliar with RSS feeds, start with this post about Google Reader. Here I’m going to talk about how you can push RSS feeds to your students via your website or CMS (e.g., Angel). This is from my personal web page. Everything in the box comes from the American Psychological Association (APA). Every time APA updates their news feed, the content in this box is updated. If you visit my website and click any of those titles, you’ll be taken to the full article. Next, you’re asked for the URL of the feed. To find it, look for the little orange icon. 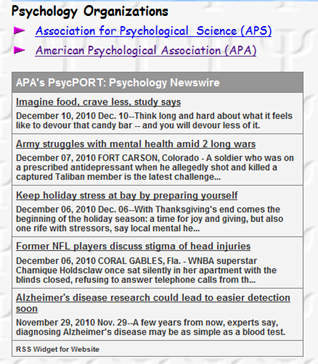 On APA’s website, for example, there’s a “News & Events” section. It’s there where you can find the RSS feed URL I used to create the above RSSbox. Following that link, I was given the option to choose from a number of feeds. 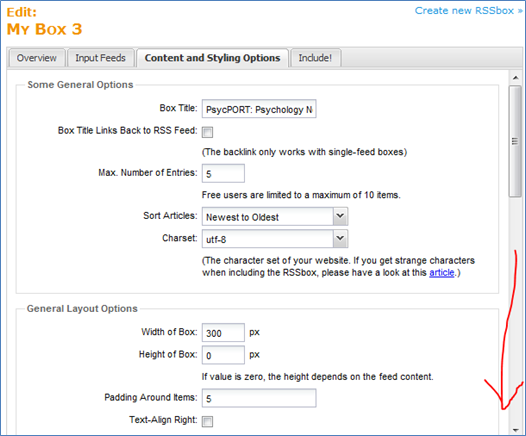 I chose this one: http://psycport.apa.org/siteware/rssfeed.xml. Here I’ve entered the feed URL. Now you can jazz it up a bit. Decide what title you’d like, the number of entries you want to appear in your box, the size of the box, the color of the font and the background, and so on. Once you have it looking as you’d like, click the “save and preview” button at the bottom of the page. Do you like how it looks? It’s ready to go live! Try it out. If you run into any problems, let me know! A month ago I wrote about NudgeMail, a service that allows you to send email reminders to yourself in the future. For example, if you send an email to Monday@NudgeMail.com, you’ll receive that email back from NudgeMail on Monday morning. An email sent to 1pm@NudgeMail.com sends that email back to you the next time 1pm rolls around. An email sent to 5minutes@NudgeMail.com sends that email back to you in 5 minutes. Unfortunately, NudgeMail mysteriously stopped working for me. Since I found the service so useful, I went searching for another company that provides a similar service. I found one that does the same thing, but has some additional features. For email reminders, I’m now using FollowUp.cc. It works the same way in that if I want a reminder on Monday, I send an email to Monday@FollowUp.cc. If I want a reminder at 1pm, I send an email to 1pm@FollowUp.cc. See FollowUp’s FAQ for all of ways you can set a time for a future reminder. When I send the reminder, FollowUp.cc will add it to a calendar that I can access on their website, and it will be added to a calendar I can view in my own Google calendar. And when that reminder shows up in my mailbox later, I can ‘snooze’ it, so it’s sent to me again at some future point. I can either do what I wanted to do, or I could ‘snooze’ it. If I click ‘1w,’ I will get this same email reminder back in a week. If I click ‘edit reminder manually,’ I’m directed to a webpage where I can set the time and date myself. I wrote that email on Friday, December 10th at 5:56am. 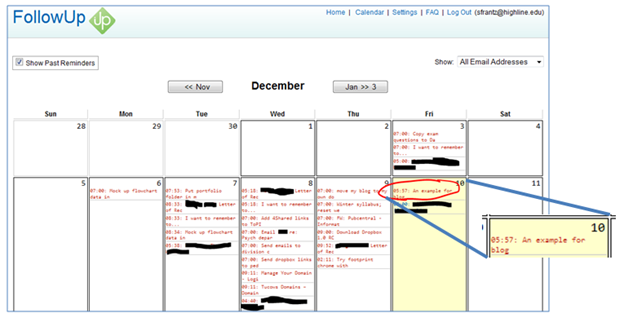 When I visit my calendar at FollowUp.cc I can see that “An example for blog” has been added. It’s in red because by the time I was ready to take this screenshot, 5:57am had already passed. Within the FollowUp.cc settings, you can get the URLs for both an iCal calendar and RSS feed. If you use Google calendar, on the bottom left, there is a section called ‘Other calendars.’ Click add. 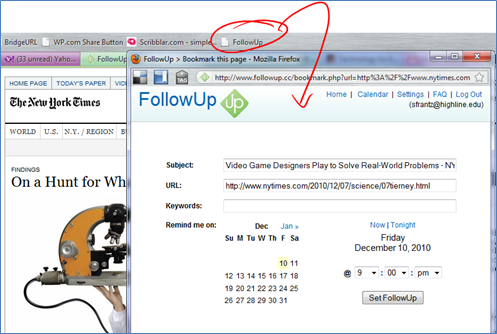 Then select ‘Add by URL.’ Then paste the iCal URL from within your FollowUp.cc Settings. The FollowUp.cc calendar only shows your upcoming reminders. (I snoozed the ‘an example’ reminder until tomorrow so it would appear in my calendar.) If you don’t want to see your reminders all the time, under ‘Other calendars,’ click ‘FollowUp.cc.’ The color will turn to white. Click it again to turn it back on. I tried out the RSS feed, but I decided that I didn’t need my reminder information in my feed reader, too. My email and my Google calendar were plenty! By adding other email addresses to your account, you can send yourself reminders from them as well. Whatever account you send from, email reminders will go back to that account. All email reminders go into the same calendar though. If I email me with something like, “Let’s find time next month to discuss (some issue),” and I cc January3@followup.cc, then on January 3rd, you and I will both get this email in our inboxes. If I bcc January3@followup.cc, then only I will get the reminder. If I use Subtextual (see this earlier post), then I can add an additional message to myself. And, of course much mixing and matching is possible. 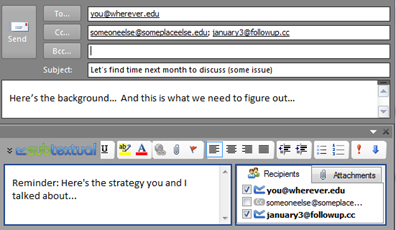 For example, let’s say that I email you, cc’ing someone else and January3@followup.cc. I then write a message: “Here’s the background…” But because I want to include some additional information in the reminder for you and me, I use Subtextual. On January 3rd, the ‘here’s the background’ email will be sent as a reminder to ‘someoneelse,’ to you, and to me. The ‘here’s the strategy’ email will be sent as a reminder to just you and me. FollowUp.cc also provides a bookmarklet. When I click a link in my browser, I can set a reminder to be sent to me later reminding me to visit that website. The developers continue to make improvements. Keep an eye on this product! Want to give out your cell phone or home phone number to students but you don’t want them to have your phone number in perpetuity? Wouldn’t it be nice if you could, in effect, change your phone number every term? After creating an account, you’ll be asked to add a phone number to your account. Once added, click the “Verify Now!” link. 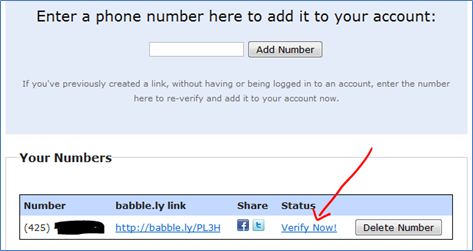 Babble.ly will generate a 4-digit code. Click ‘Call me now,’ and an automated voice will ask for the 4-digit code. You’ll be told your phone number has been verified, and then the system voice says, “Thank you,” and unceremoniously hangs up on you. I found that quite refreshing, actually. Once verified, you have a link that’s tied to your phone. Give that link to your students. 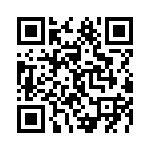 Or follow the link to get the QR code and give that to your students. Go into your Babble.ly account, and delete your number. 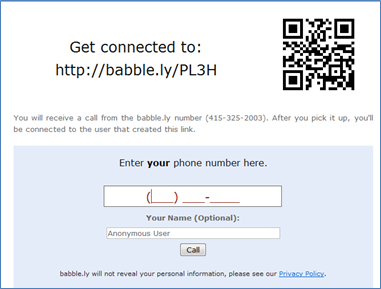 At the beginning of the next term, go back into ‘manage’ your account and enter your number again, and Babble.ly will generate a new URL for you. Verify it, and give the URL and/QR code to your students. This is a brand new service, so they’re in beta. It’s currently free, but they’re planning additional features that will be available in a pay-for version. Currently, calls are limited to 10 minutes. Back in March, I wrote about QR codes. I just came across this document which offers some interesting ideas on how to use QR codes. It was written for a K-12 audience, but there are a bunch of ideas that are relevant to higher education. I learned a couple things I didn’t know. First, the size of the QR code is correlated with the size of the URL. Makes sense. I just didn’t know that. If you have a long URL but want a small QR code, use a URL shortener like bit.ly or goo.gl then create your QR code. Actually, bit.ly and goo.gl make it easy to create QR codes. Use bit.ly or goo.gl to shorten the URL. Paste the URL into your browser’s address box. Then add ‘.qr’ at the end. Hit enter. Bam. QR code. Just copy and paste the code wherever you’d like. For example, this link will take you to the main page of my blog: http://goo.gl/FtvWJ. When I add .qr at the end, http://goo.gl/FtvWJ.qr, I get this QR code. I right-clicked on the image, selected copy, came here and clicked paste. For generating QR codes from websites, I use a Firefox Addon called QRLinkMaker. I right-click anywhere on a webpage and select “QR code.” A pop-up box gives me the QR code. I right-click on the image, click copy, then paste wherever I want it. If you right-click on an image, the generated QR code will send users just to the image. One suggestion offered in the document is to create a tour of campus for new students. I can envision something like this. The students get a map with certain areas marked, such as the bookstore. Outside the bookstore are 2 QR codes. One is labeled “Website” and printed in black. The students scan the QR code into their phones to visit the bookstore’s website. The other is labeled “Video” and printed in blue. The students scan the QR code to watch a short video. The video could be something like the bookstore manager welcoming students to the store and explaining some of the key things students need to know about the bookstore. Clearly there’s nothing special about the color of the codes other than, with experience, the students will see the color and know what kind of information the code with give them. If you do this as a scavenger hunt for something like a freshmen orientation course, you can have students respond to questions. While the number of students with smartphones is on the increase, not all students have them. I suggest having students work in pairs or small groups where at least one person has such a phone. My syllabus is available on my website as a pdf. 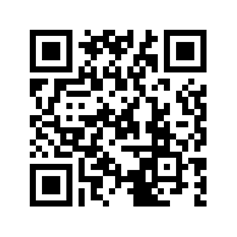 After I post it, I generate a QR code for it, add it to my syllabus, and then resave my syllabus to my website. This is from the top left corner of my syllabus. Although next quarter, I’m going to generate a QR code from URL shortener so I can shrink the size of the QR code. When you distribute handouts, include QR codes to online content, such as videos. It’s a whole lot easier to scan a barcode and watch a video on my smartphone than it is to type a URL into my browser. I’m also picturing my next poster presentation at a conference. I can add QR codes that direct visitors to websites or videos. Actually QR codes can be used for anything, really. Let’s say at my poster presentation, I run out of handouts. 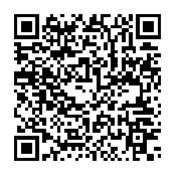 Scan this code to generate an email to me with the email address, subject line, and message already filled in. Earlier I mentioned a scavenger hunt for a freshmen orientation course. QR codes can be generated for plain text (see QR Stuff again). You start students off with some clue, like, find the Campus Security office. When students arrive there, there’s a QR code posted next to the door. Scanning this code generates a message that directs students to a specific book in the library. Perhaps in the front of the book is another QR code that generates a phone number. Students call the number, and it’s the office number of their instructor. That’s how the instructor knows the students have completed the hunt. Granted a 2-stage scavenger hunt isn’t very useful, or fun for that matter. But you get the idea. QR codes make it easy to move between the real world and the virtual world. We no longer need to be in front of a desktop or laptop to access the internet. For many students, the internet is at their fingertips. Let’s use it. With the end of the term upon us, are you looking for a better way to detect plagiarism? We’ve probably all put a suspect passage into Google. If the quote is exact, the source is easy to find. But what if the student has changed a few words? Those are a little tougher. But here’s a little known tool that can help a lot. In Google, you can use the operator AROUND (must be in all capital letters) to find terms are phrases that are ‘around’ each other. Plagiarized passage: When someone has PTSD, it can seem like they’ll never get over the trauma. If I drop the suspect passage into Google, this is what I get. The original source is not here. In fact I went 5 screens deep without encountering the original source. But now let’s do a search using AROUND. To use it, I take a guess at what I think the original words likely were. 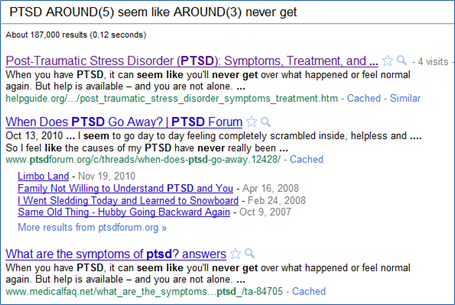 I chose ‘PTSD,’ ‘it may seem like,’ and ‘never get over.’ Those are pretty sketchy terms to use in a normal Google search. But here, they become much more powerful. PTSD AROUND(5) it may seem like AROUND(5) never get over. 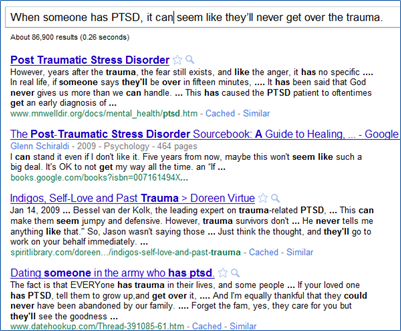 This tells Google to search for web pages that contain the word PTSD, then look within 5 words of it for the word seem. Also look for the word like and look within 3 words of it for never. Oh, and look for the word get, too. The first and third results give us the source. (Who knows which is the original? Plagiarism on the internet is rampant. That probably doesn’t help our students understand it’s wrong.) The second result does meet the criteria we gave Google; it just doesn’t contain the passage we’re looking for. 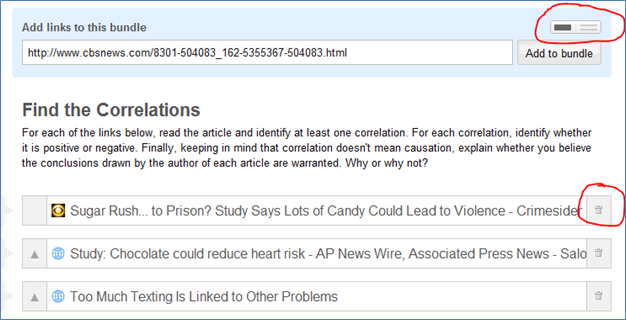 I hope all of your students properly cite their sources, but if they don’t, this search tool should provide some help. Wondering what else Google can do? Check out the Google Guide.